Weaving is the process of making fabrics by interlacing the threads lengthwise and widthwise commonly known as warp and weft in a regular order. The operation is performed in a machine called a loom. Two sets of yarns are interlaced, almost always at right angles to each other. One, called the warp, runs lengthwise in the loom; the other, called the filling, weft or woof, runs crosswise. The raising and lowering sequence of warp threads in various sequences give many possible weave structures. The weaving is a process of formation of fabric with interlacement of two or more sets of yarns using a stable machine called loom. Human beings have started using the woven fabrics since the dawn of history. If we exclude the Stone Age period, we may conveniently say the history of civilization is also, to some extent, the history of weaving. Though primitive civilizations used coarser threads to make fabrics which were crude and coarse, there are references to fine fabrics made from the filament of silk in China. Silk was one of the most important products in China 4000 years ago. In India too, there existed some of the finest hand-woven fabrics. There are some references in Tamil literature, that the great poet, Thiruvalluvar was a hand loom weaver. It is still not certain when the weaving process was introduced to human society. It is clear from many historical records that weaving originated long before the time of Jesus Christ. In England, the major shift from agriculture to the woolen industry came in the 14th century. The earlier version of power-loom was run by two men. After the steam engine and cast iron in early 1800, great attention was paid to increasing productivity of the machine. To help achieve the increase in productivity, William Radcliffe patented a dressing frame in 1803 for sizing and drying the warp threads prior to winding on to a weavers beam. Traditional looms then were stopped every few minutes in order to replace the empty weft pirns or cop in the shuttle and this limited the number of looms. 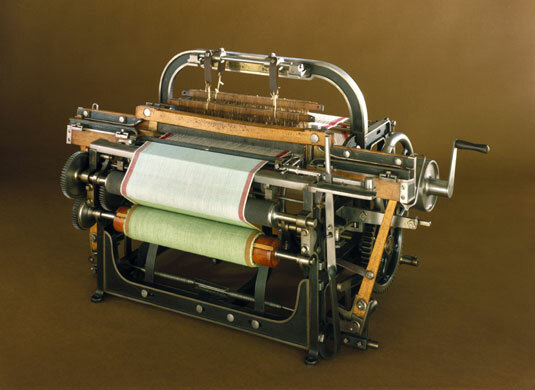 An English man who emigrated to America and worked for the Draper Corporation completed an automatic weft transfer system which replaced the weft pirn in the shuttle without slowing or stopping the loom in 1889. The dynamic problems created by the picking and checking mechanism and the inherent process of pirn winding for shuttle looms had encouraged the loom makers to develop alternative means of weft insertion in which heavy shuttle is not projected forwards and backward across the width of the loom. It is customary to refer these looms as shuttleless looms. yarns (synthetic fabrics) can be woven. a popular type of loom and its functions are excellent overall. Looms; Rapier Looms; Water Jet Looms, and Air Jet Looms. A weaving machine in which the weft thread is gripped by jaw(s) fitted in a projectile, which is then propelled through the shed. It has a small hook-like device that grips the end of the filling yarn.It is sometimes called missile loom as the picking action is done by a series of small bullet like projectiles which hold the weft yarn and carry it through the shed and then return empty. device holds the ends of the wefts in place at the edge of the cloth to form the selvage. This loom needs smooth, uniform yarn which is properly sized in order to reduce friction. 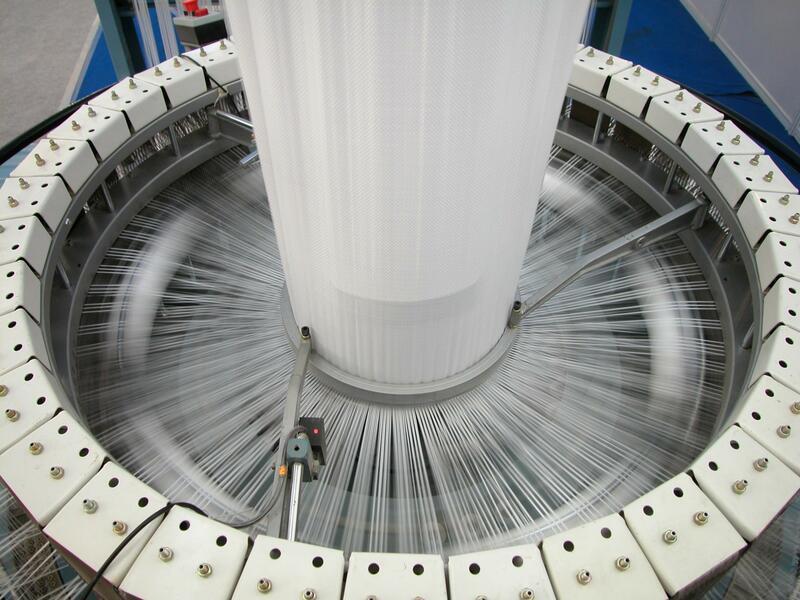 Projectile loom can produce up to 300 ppm and is less noisy than the shuttle loom. Rapier looms are machines in which the means of carrying the weft through the shed is fixed at the end of a rigid rod or in a flexible ribbon, this being positively driven. A rapier machine may have a single rapier to carry the weft across the full width or a single rapier operating bilaterally with a centrally located bilateral weft supply, or two rapiers operating opposites sides of the machines. Rapier loom comes in many types. Early models of it use one long rapier device that travels along the width of the loom to carry the weft from one side to the other. Another type of rapier loom has two rapiers, one on each side of the loom. They may be rigid, flexible or telescopic. One rapier feeds the weft halfway through the sheds of warp yarns to the arm on the other side, which reaches in and carries it across the rest of the way. Rapier looms are very efficient and their speed ranges from 200 to 260 ppm. 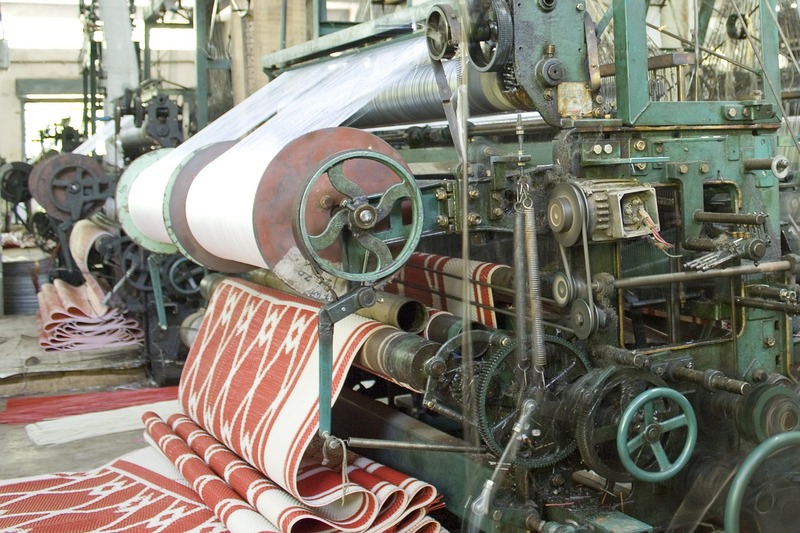 These looms can manufacture a variety of fabrics ranging from muslin fabric to drapery fabrics and even upholstery fabrics. In water jet loom, a water jet is propelled across the shed with the force, that takes the filling yarn to the other side. place much tension on the filling yarn. As the pick is tensionless, very high quality of warp yarns are needed for efficient operation. Also, only yarns that are not readily absorbent can be used to make fabrics on water jet looms such as filament yarn of acetate, nylon, polyester, and glass. However, it can produce very high-quality fabrics having a great appearance and feel. In air jet loom, a jet of air is projected across the shed with the force, that takes the filling yarn to the other side ie. a jet of air is used to propel the weft yarn through the shed at speeds of up to 600 ppm. Uniform weft yarns are needed to make fabrics on this loom. Also, heavier yarns are suitable for air jet looms as the lighter fabrics are very difficult to control through the shed. However, too heavy yarns also can’t be carried across the loom by an air jet. In spite of these limitations, air jet loom can produce a wide variety of fabrics. machine. A circular loom is primarily used for bagging material. The multiphase loom can form many different sheds at different places, thereby enabling insertion of a number of filling yarns, one behind the other. This is the type of automatic loom in which the loom takes the empty bobbin from the shuttle and automatically replaces it with a new, full bobbin into the same shuttle. This exchange is made without stopping the loom. In this case, the weaver is restricted to one shuttle and one color warp yarn ( called battery type). Another new type can use four colors in the warp. This is the type of loom used for making narrow fabrics. This is the type of shuttleless weaving machine in which the weft is drawn from a stationary supply and introduced into the shed in the form of a double-pick by a weft inserter needle. The weft is retained at the opposite selvedge by the action of knitting or by the introduction of a locking thread from a separate supply. This is the type of loom meant for narrow fabric such as ribbons and tapes, the picking is done by a special type of small shuttle controlled by a swivel. A loom having two or more shuttles used for weaving fabrics containing weft yarns different as to size, twist or color.